50% of our membership is made up of young people under 25 years of age. 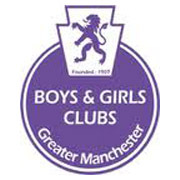 In addition to the range of sports we offer within our club, Barton AC are proud to affiliate with Boys and Girls Clubs of Greater Manchester. This successful link enables us to offer a wider range of activities and opportunities to our younger members. Activities include snowboarding, climbing wall, kayaking, outward bounds, caving, snooker, table-tennis, hill walking, abseiling, canoeing, cycling at the Velodrome, 5 as side football and much more. This enrichment policy extends the reach and maximises the benefits of our club, offering opportunities, often unavailable, to our younger members. During the year, our young Barton AC members will be given the opportunity to join in with various events in association with Boys & Girls Clubs of Greater Manchester. If you would like to be notified of these upcoming events please join our mailing list or visit this page for updated information. Events will also be advertised on the Barton AC noticeboard. Limited spaces are available for each event with all places allocated on a first-come, first-served basis.